Each year the app business gains momentum as an economic force in the global economy with app usage and revenue increasing rapidly. According to this statistical report, global app revenues amounted to $41.1 billion US dollars in 2015 alone and are expected to rise to more than $101 billion USD by 2020. In many cases apps are replacing websites as the number one source of information, entertainment and commerce today. Given the historic business opportunity that apps provide, there has never been a better time to tap into the app business, as it were. If your app achieves any degree of popularity–or even virality–it will not only create a steady source of income, but can also help fulfill other business goals for your company, i.e. brand recognition, visitor funnels, advertising revenue, etc. However, building and growing an app business gets more challenging over time as the industry consolidates and competition increases. 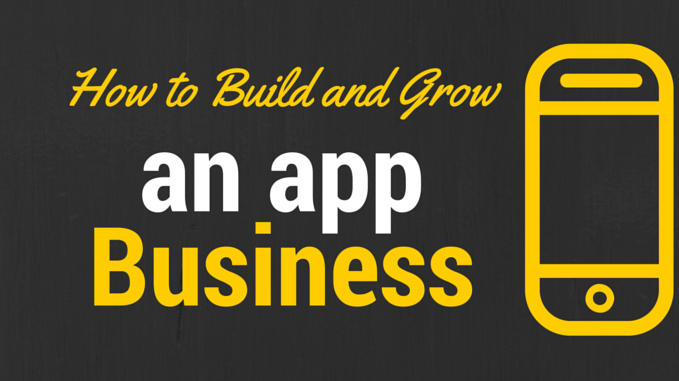 Let’s take a look at the key steps necessary for building and growing an app as a business. Unless you have the resources to do in-house development, you’ll need a suitable vendor to hire or perhaps to partner with. Explore different avenues to gauge the price and specs of the type of app you are interested in developing. Do yourself a favor and don’t base your decision on price alone. Find an experienced developer with demonstrated expertise in UI/UX (user interface/user experience), as a foundational requirement for your end-product. Look at the design specs of the platform for which you are developing the app, and the experience of development companies you are considering for help in this area. A basic question is whether you’ll be developing for iOS or Android, or both; you cannot necessarily expect a team competent with one OS to be able to deliver quality on the competing OS. Remember that high cost doesn’t necessarily ensure high development standards. The best mobile apps companies are not just a group of developers, but a team of people who don various hats from project managers to designers and developers. You can only be assured of an economical and quality standard app if you set aside the time to do in-depth research and as to the best company for your particular requirements. When designing an app, keep in mind the layout and design. Select only visually appealing and attractive designs because folks nowadays decide whether or not to use an app based on its first glance. Always put design first and functionality second, although you may think that it will put off geeks. With so many apps being installed, opened once, then never used or deleted immediately, initial impression is critical, as traction can be gained quickly if your app has a good aesthetic layout and whose usability is immediately apparent. Your app doesn’t necessarily need to be built around a popular subject, or crowded niche. As with niche websites, there’s a lot to be said for appealing to a narrow market segment. Millions of dollars have been made by companies who produce apps that target often obscure, yet profitable niches. On the other hand, to gain a competitive edge over the millions of apps already in the store, another approach is to aim to provide a feature no other app has. Take QUAD for example. Its founders found a vulnerability in already existing messaging apps like WhatsApp (i.e. that don’t offer bulk messaging) and took it upon themselves to offer a unique solution for a segment of their user base that was clamoring for it. They then aggressively marketed the app to target groups like college students and hence ended up making a place for themselves in the cut-throat niche of messenger apps. Are you aware that as with optimizing your website around specific keywords to boost its rankings on search engines, best practices dictate that you apply the same strategy for your app description in the App Store or Google Play, etc.? Make sure that your app’s title includes the keywords that users will search for specifically when they look for an app specific to your niche on the app store. For example, “WhiteHunt” will not appeal to users more than “WhiteHunt Land & Property Consultants.” The bottom line is that you should rank for popular but unique and medium-search volume keywords when deciding a title for your app. And again, don’t forget to include relevant keywords in the app description. You’re looking to grow a user base and attract the attention of investors, so it is of paramount importance that you launch your app early. Launch the main features first and get a community of users (and hopefully experts, who will promote your app) to rally behind the app. This will give you invaluable data as to who your users in fact are, and what they really prefer to find in your app, as opposed to what you think they want. Done properly, as you grow your user base through successive iterations, you’ll know which group of people to specifically target, as well as what features to expand upon or drop. Most app development projects probably end up needing a bigger budget to build and promote your app than originally forecast. Remind yourself that you are playing a longer-term game here. To this end, consider promoting your app through popular companies such as Android Pit, Apps Zoom, App Annie etc. Most companies like allow you to choose an economical package which will be appropriate use of your particular marketing budget. Look for any kind of mobile app ‘award bait’ such as Best Mobile Apps, Leading Mobile apps etc. and seek to enter your app into these contests. Whether you win or not the exposure your app gains will be vital for expanding your user base. After putting so much money and time into planning, developing and marketing your app it would be a shame if you yourself didn’t act the part of a real businessperson when you really start with promotion. Carry business cards, brochures and the like, and seek out networking events where you’ll encounter people who can facilitate distribution for you. Now is the time to emulate the habits of the successful entrepreneurs you’ve been reading about all these years! Seek to market your app appropriately. The most important selling factor of your app is going to be the user base. There is probably no better marketing than glowing word-of-mouth recommendations and user testimonials. And again, to grow a user base it is important to first test the waters i.e. releasing core features early, maybe even offering a free version first, and if it seems to gain traction price and market it accordingly. Remember, though the app ecosystem has become more competitive over the years there are still many apps released each year that do spectacularly well. For an app idea that seems to have promise, development costs are usually still relatively low compared with other products or businesses you can launch. And, a successful launch can still completely transform different aspects of your business in 2016, and beyond. If you have other tips to add please feel free to comment below, and we’d really appreciate it if you’d share this article–using one of the icons on the left–if you found it to be a helpful overview. This article was written by Usman Hassan, a digital marketing psychopath, who is passionate about Inbound marketing, SEO, CRO, Email marketing and Ecommerce. He is a regular writer at Mobiwoz.com .